Situated approximately 15Km inland from the Costa del Sol and 40Km east of Malaga, Canillas de Albaida lies in the area known as Axarquia, at a height of around 570m above sea level, in the Sierra de Almijara, which rise to 2000m, high enough to be snow capped some of the winter. Canillas de Albaida is a small pueblo blanco (white village) with a few amenieties, including a swimming pool and of course bars/restaurants. The surrounding area is very agricultural, growing fruit trees and grapes for the production of raisins (you will see many of the drying racks on south facing slopes for drying the grapes). 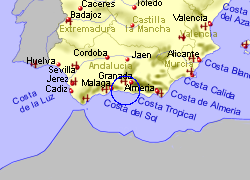 Map of the Canillas de Albaida area. Beautiful 2-bed townhouse ideal for a family or couple. Quiet area with sea views, communal pools, bars, restaurants, local bus service and lots of beaches. 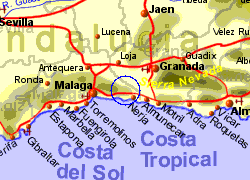 Close by Nerja town. Casa Bonita is an immaculate & completely renovated 2 bedroom terraced beach house situated in the peaceful Punta Lara urbanisation; a very pretty pueblo of whitewashed houses. Ideal for families and couples who like quiet relaxing holidays yet within easy reach of bars and restaurants. Villa Laura is a fully equipped, high quality villa just a short walk to the beach. The city center is a couple of kilometers away. The yard is protected by a brick wall. It has an exquisite 20 square meters swimming pool, that comfortably cools under the warm blazing sun. You can relax in the sun loungers by the pool or test your skills at the billiards and ping-pong. There is also a barbecue in the yard. Situated on the outskirts of Nerja in a peaceful area of the countryside, this villa is ideal for families with younger children. Located on a single storey, it is very convenient for little ones and with Nerja a short drive away, along with sandy beaches, it could not be better positioned. The villa is decorated in an authentic Spanish style throughout, but remains well equipped with mod cons such as satellite TV, ipod dock and air conditioning. Villa at walking distance from Frigiliana. Ten minutes walk to Frigiliana, via a somewhat adventurous country trail. Don't turn around when you drive to the villa for the first time. It takes a bit to get here by car, but it's well worth the journey! 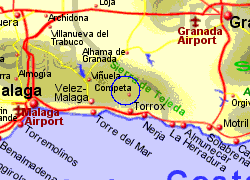 Once you are here, the owner will show you the way to Frigiliana across the valley, only a ten minute walk. Villa Casanova is a restored Olive Mill, in the Natural Park of Maro, on the coast of Andalucia. This ten-person luxury holiday home boasts expansive lavish grounds and is within walking distance of Playa de Maro, which is recognised as one of the superior beaches in Andalucia. The view of the coastline is scattered with cliffs, where hidden crystal-clear lagoons and waterfalls can be discovered. A fantastic holiday home for big families or for groups of up to 23 people. The rooms are not rented out separately. It is approximately 800 metres away from the village of Sayalonga, which is connected with a nicely paved road and a 200 metres long dirt track, which is suitable for all types of vehicles. This holiday home with 2 floors plus attic is divided into 10 bedrooms, 8 bathrooms and a large living room with fireplace and a fully equipped kitchen.